Recently I reviewed The Clovis Incident, the first Saha Solomon mystery, and today I’m happy to have the author, for an interview. Pari Noskin (aka Pari Noskin Taichert) garnered two Agatha Award nominations for her first mystery series originally from the University of New Mexico Press. Like her New Mexico heroine, Sasha Solomon, Noskin is a multi-year veteran in the PR industry. Her first three books are: The Clovis Incident, The Belen Hitch and The Socorro Blast. She is also founder of the Anthony-nominated blog, Murderati.com, and a national award-winning freelance features writer. In her new series, featuring television personality and psychic Darnda Jones, Pari leaves the comforts of the familiar and explores what it means to be truly connected to the natural world, to understand other creatures’ perspectives. That’s because Darnda is much more interested in communicating with non-humans than most people she knows. Don’t worry, Pari isn’t anti-social. She enjoys hearing from her readers whenever they take the time to send her a line! AF: I noticed in your notes at the end of the The Clovis Incident that many people in Clovis helped you witthe book. What it was like bringing this idea to them? Any favorite stories from your research? PN: People ranged from amused to moderately concerned. One of the things that really has struck me through writing the first three Sasha books and working on the fourth is that my ideas about PR and marketing, of the places about which I write, often mirror what city councils and local tourism departments are already discussing. This was true a bit in Clovis; some people really wanted to cash in on the UFO angle. It has been even more striking with my subsequent books. A favorite research story? Hmm. I learned a lot during the writing of this first book in the series. One important thing was that it takes time and knowing the right people to get at the kinds of information I wanted. I was fortunate enough to speak with some city leaders and influencers who were quite frank with me. I don’t know if they liked the final product, however. It seems to be much more popular with people who have either lived in and moved away from Clovis or live close by but not in the city itself. That said, it has sold very well there. AF: I know nothing about the PR field so I found Sasha’s work fun to read about. She comes across as a creative risk-taker, someone who enjoys the gamble of bidding for a free-lance job over the security of something steady. Has your PR experience helped you as an author in addition to making it Sasha’s profession? PN: My PR experience spans well over 30 years and it has been tremendously helpful in my professional and writing life. PR forces one to always consider the perspective of the audience. I don’t write to audience, per se, but I think about how my words and stories’ structure affect the end product… the telling of the tale. I did work as a freelancer for several years. It was a great experience in forcing organization and nurturing a continual moxie when it came to thinking about projects — how to get them done and what angles would be most effective. AF: I have a partially-formed urge to visit Clovis after reading this book, though I’m not sure why. If I follow up on it, what would you recommend? PN: I don’t know if I’d recommend going there nowadays. One challenge in writing about local restaurants and other businesses is that things change. Life rolls on. The Clovis Incident was published long enough ago that I suspect there are far more changes than constants in that city. Roswell has changed quite a bit too. AF: The next books in the series feature Socorro and Belen. What made you choose these locations? And Clovis? I always fall in love with the places about which I write, too. AF: What is your favorite place in New Mexico and why? PN: Not fair. I love many places here. I’m a native through and through—born and raised in NM—and I know there are so many locations to discover. You know what my favorite place (characteristic) is in NM? It’s the space … the ability to drive for just a few minutes outside of ABQ or any other town and be in the middle of all of this glorious, stunning, gorgeous land. I love the colors of this often parched land, the hues of yellows, browns, pinks, reds, blues … I love that we can be right next to ancient history without expending much effort: the ruins of old pueblos, Tres Piedras’ petroglyphs, old towns, plazas, wonderful old cemeteries. Driving around NM, I always wonder about the people who passed before. When I see a solitary road going off into the distance, I wonder who might live there, what life would be like in the middle of this possibility in a basically harsh environment. I find all of New Mexico, especially outside the cities, incredibly inspiring and intriguing. AF: This is off the wall, but then the whole book is (in a good way). Do you speak Cantonese? I may have taken more interest in this than some readers, but I studied Mandarin for a year and had no idea how different it was from Cantonese until I read the scenes in which Sasha brushes off her language skills. From this and from the way you blended Buddhist beliefs about the dead into the story, I got the impression you were well-acquainted with Asian cultures. What’s your background in this area? PN: That’s a fun question. Thanks for asking. I earned my undergraduate degree at the University of Michigan in Asian Studies and lived in Hong Kong for almost a year as a college student. Asian philosophy has interested me for decades; it also helps that my mother collected Asian antiques so I grew up learning about these cultures. Also, I’ve always been interested in other languages as windows into the way other cultures think and perceive the world. I’ve studied seven so far. AF: In The Clovis Incident, Sasha meets some apparently sane, coherent, functional people (as well as some who are more on the fringes) who claim to have encountered aliens. Tell me about your sources for this material. PN: All of the characters came straight out of my odd imagination. I study people and so some did remind me of folks I met along the way. But I made every single one of them up — from cell to cerebellum. AF: When you start a book, do you know how it ends? What’s your creative process like? I never know the ending. I really admire people who outline and know where their writing is going. I’ve tried. Believe me, I’ve tried. But I have to just jump in and start writing and see where the story and characters take me. It’s not a very efficient way to write and I end up throwing away a lot of words and concepts — far too many — but no other way works for me. I love the process of discovery and am grateful that I enjoy editing too. AF: What are you currently working on? PN: I’m actively working on the second book in my Darnda Jones series. The first one, Stung, is available electronically and will be, eventually, in print. Darnda was born in the Sasha series and I liked her so much I wanted to know her better. She is a psychic/telepath who works as a professional “pest controller” and has a television show doing just that. What makes her especially interesting is that she cares far more for insects, animals and most plants — and for the natural world and health of our planet — than she does for most human beings. She’s a deep and wonderful character. I really wish I knew someone like her. Does it say something weird that I’ve actually created one of my own best friends? Also, I’m part of a writers’ collaborative now, Book View Café, and we serve as a publishing house for each other. All of us are multi-published, so the quality of all of our work is very high. I like the independence of this model — rather than more traditional models — and the fact that I can write what I want rather than what might be expected. I’m also working on the next Sasha book. It is located in Las Cruces, NM and explores the chile pepper industry and organic vs big agriculture. AF: Thanks for being my guest. I look forward to discovering Darnda. Follow Pari Noksin on Goodreads and on Facebook . Until I read this book, all I knew about Clovis was that it was home to the Norm Petty recording studio, where Buddy Holly recorded his hits. It’s not one of New Mexico’s more famous places and seems unlikely ever to be one. This makes the premise of the book immediately appealing. Freelance PR pro Sasha Solomon is trying to get a gig promoting flat, unimposing Clovis as tourist destination. She was doing PR for a health care company that included alternative therapies in it coverage, and in true Albuquerque/Santa Fe area style, she tried out so many shamans and other mind-body-spirit healers she had a kind of psychic meltdown, making her mental boundaries so porous she now hallucinates under stress. She’s been fired, and she needs the Clovis job. 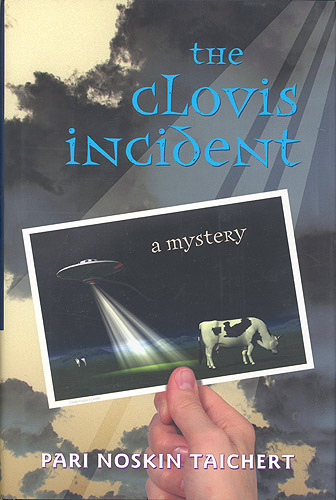 The story gets more and more eccentrically New Mexican as Sasha looks into alien abductions as part of her PR plans to promote alien-seeking tourism in Clovis, (Her visit to alien-centric Roswell is a small but delightful part of the book.) Alien abductions also figure in a murder investigation, as do Sasha’s strange visions, when the body of a Singaporean military officer is found on a friend’s land. The less colorful aspects of life in Clovis, from the military base to the farms and ranches, are portrayed with respect and realism in the framework of a humorous mystery. In a crucial scene set in the midst of a large-scale dairy farm, suspense and comedy run neck in neck. Author Pari Noskin captures characters brilliantly, whether they are major players or walk-ons. Sasha is an original creation, likeable but far from sweet. Detective LaSalle grew on me. The longer Sasha had to deal with him, the more he was revealed in the slow, natural way strangers get to know each other. 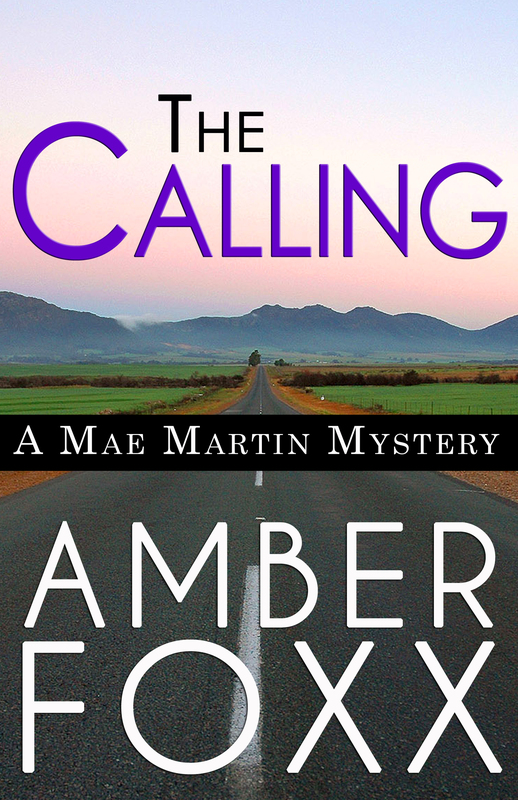 Underlying themes include mother-daughter relationships, friendships, rural life, and romance in middle age, tied together through the mystery and laced with an inside look at the PR business. The mystery is multi-layered with so much entertainment that I sometimes forgot to try to solve it. I know a book is working when I respond to it as a story rather than a plot. It turns out that I did suspect the real culprit, but I never felt that the author had made it too easy to figure out. Noskin turns some off-beat phrases, with a style unlike any other. Aside from Sasha’s appalling habit of taking shots of whipped cream straight from the can, I thoroughly enjoyed every page. My interview with the author will be posted in the next week to ten days. Meanwhile, you can buy the book and enjoy an unconventional trip to Clovis. In 1993, a group of approximately 4,000 people practiced meditation in a focused and consistent way for a measured time period as part of an experiment in reducing crime in Washington DC through creating a more peaceful collective consciousness. The crime rate was significantly reduced. This was a successful, well-designed scientific experiment, and from the 1970s through the 1990s several others were done with similar results. This type of intervention hasn’t become a mainstay of public policy, though a study done in Merseyside, England found that it saved the local government money. Do we need more meditators? More people in in government who pay attention to these ideas? Though I write fiction that involves psychic phenomena, it’s not the only reason I find the science behind it important. I’m reading Dr. Larry Dossey’s book One Mind, and I’ve been thinking about the effects our multiple minds have on the One Mind we all share—the interaction of our individual psychology with transpersonal psychology. It can be positive, like the meditation experiments. It can be negative, like the rising level of what I’ll call recreational anger in the United States. I get the impression there is an audience for anger—angry radio, angry TV, angry politics—and that the audience is getting pleasure out of this state of hostile arousal. I’m not one to enjoy outrage for the fun of it, so I can’t claim any insider insights into it. As an observer, I wonder, does it create a wave of disturbance leading to additional anger? Do negativity and meanness have a kind of viral quality that can spread through the shared psychic space of a culture? Is there any connection between our level of anger-for-fun and anger that kills? I don’t know the answers. Still, I’d suggest that each individual contribute his or her drop of peace to the ocean of the collective consciousness through actions, thoughts and words as well as meditation. It’s an experiment worth trying. Imagine what would happen if we all practiced self-forgiveness and self-study. If we humans all sought moments of stillness and awareness of beauty. Paused to reflect before speaking and acting. Made a daily practice of seeing what Buddhist teacher Jack Kornfield calls the “inner nobility” of others, whether they are family members, friends, opponents, or strangers. Perhaps we can change the world-mind, one careful, loving person at time. Our peace-minds would be the psycho-spiritual equivalent of the sterile male mosquitoes that scientists release into disease-ridden areas. No one gets killed. The problem stops reproducing. To continue my epidemiological analogy, when the effort is dropped, the mosquitoes find fertile partners again and the diseases they spread come back. We can’t take peace and wisdom for granted. 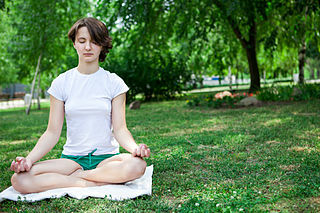 Meditation is a called a practice for a reason. Do you notice changes in your life if you keep up the practice?